Every waterman needs (at least) two boats. One that you can throw on the roof of a car for a quick dunk and another for hauling out friends or going on an expedition. So far, I’ve kept my fleet to that rule. Boat one is Terrapin, an Adirondack guideboat. This boat is kevlar and was built about ten years ago by the fine folks at Adirondack Guide-boat of Vermont. I’ve taken Terrapin on class one rivers, camp-cruising from Olympia to Port Townsend, Washington, and in moving water dodging logs and debris. All of my trips have been with just me in the boat. In calmer water I have taken out two boys under twelve, two other adults, and occasionally one other adult. As the boys have grown, they’ve become more comfortable and understanding about how to move around in the boat and what can (fishing from the seat, dragging toy boats, splashing) and can’t work (standing up, rocking). As the boat gets more loaded, it gets more stable, but the freeboard goes down (yes, I know that sounds obvious, but it is an important consideration). So the speed and seaworthiness also shifts depending on the weight. I feel perfectly comfortable in small waves or boat wakes when alone. The more people in the boat, the more careful you need to be about shipping water and the passengers destabilizing things. I’ve done a capsize drill and found that I had to push the boat under to get it to fill with water. Getting it bailed out is a little more difficult though! The boat’s strengths are its flexibility to carry various loads/passengers, its light weight and portability, ability to handle waves, and the ease with which you can row it for long periods. The boat’s weaknesses include the low freeboard at the mid-point, it doesn’t turn extremely quickly to avoid unforeseen dangers, and that you can’t really move around much in it, which can be tiresome on a long trip. For sailing and taking a crew there’s Row Bird, an Arctic Tern, sail and oar boat designed by Iain Oughtred. Drawings with dimensions (this is a PDF). Built largely by Andy Boat and Andy Bike, I’ve had Row Bird on the water since August 2012 and am pretty fond of her performance and looks. 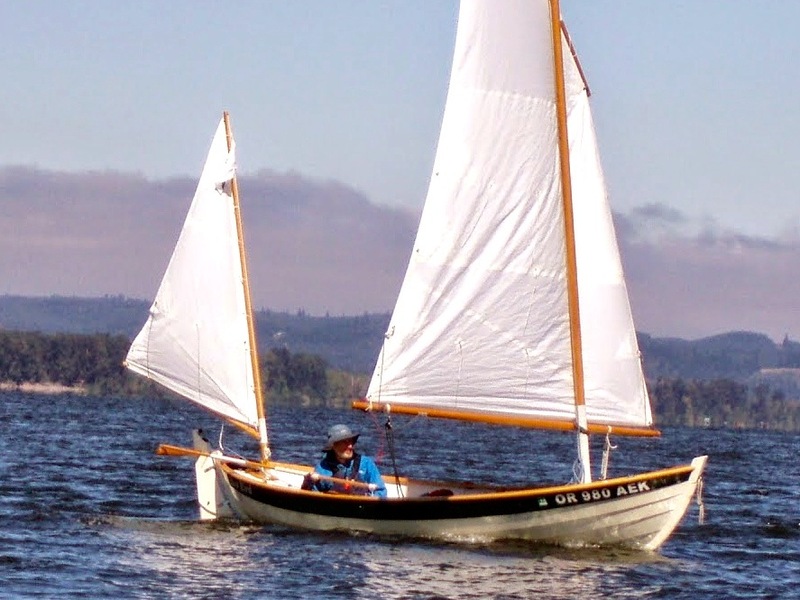 She’s got a lapstrake plywood hull and lots of different kinds of solid wood trim and spars. I really like how quickly the boat rigs up and how simple everything is once you’re underway. There are no pesky stays and only a mainsheet in the cockpit, so there’s ample room in the middle (except for those long oars always underfoot). It holds a lot stuff and people, and is very comfortable. People told me lugsails wouldn’t go to windward too well. This one doesn’t point as high as a sloop, but is no slouch. Downwind she really gets going nicely. In light wind Row Bird moves along just fine, but isn’t the fastest thing on the water. She seems confident in all conditions I’ve taken her out in so far, but she certainly performs best in winds over 5 knots. There’s a complete review of the boat at Small Boats Monthly. Please subscribe to get the whole article. Lastly, Row Bird has a push-pull tiller. It was weird at first, but within a few minutes, it feels just as natural as a traditional one. My advice: never look at it while you are steering. It’s like hearing a recording of your own voice or watching yourself on TV- it just messes up your perception.